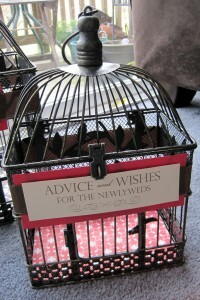 I love the idea of a wedding wishes jar rather than a guest sign in book. Often a guest book just gets filled with signatures and leaves pages of empty paper to waste. 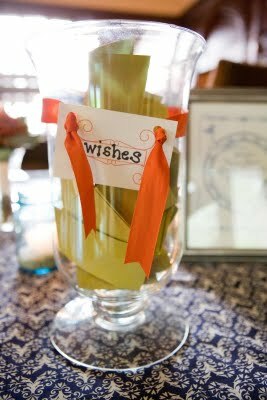 Instead of signatures and short messages like “congratulations!” doing a wish & advice jar is a great idea that will possibly give you a more intimate message from your guests. They will have a place to write down all that they want to say right down to some advice on a good marriage. There are so many options of how you could do this and it’s easy to match with your decor. You can use different color papers, ribbon, pens, and pencils, or whatever you fancy. 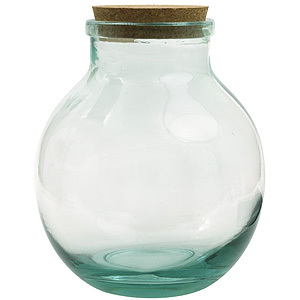 You can use apothecary jars, vases, recycled jars, cookie jars, a birdcage, or even a specially decorated box for guests to drop their wishes into. It may be a twist on the traditional but it is guaranteed to leave you with lots of wonderful reading to look back on. 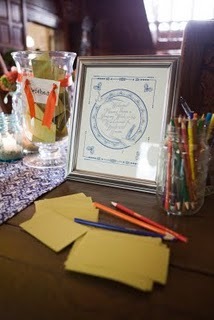 For after the wedding this can be a fun little project to relive all the little messages from your guests. What fun! My wife and I used your idea, we did unique jars/vases in our wedding colors and had people right advice on paper strips and drop them in the jars. We love reading your blog, and find your advice helpful for inspiring us for our own wedding. Thanks!